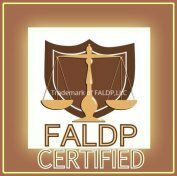 FALDP Certification is an internal certification system available to members in good standing of the Florida Association of Legal Document Preparers. Florida legal document preparers are not certified by the State of Florida, Department of Business and Professional Regulation (DBPR), the Florida Bar or any other entity. Members who choose to become FALDP Certified must pass a Basic Skills & Knowledge Exam; at least one Focus Area Exam; and complete 10 Continuing Education Units. If an FALDP member displays the FALDP Certified logo on his or her website or in any advertising, that member should also be listed on this page. Only FALDP Certified Members may use the FALDP Certified logo. FALDP Certified Members' information will be displayed on this page as each member completes the necessary steps for certification. For more information about FALDP Certification go to our certification page. Company Name: Easy Tramites Corp.
Company Name: Affordable Divorce Source, Inc.
Company Name - Separate Ways, Inc.
FALDP Certified Members' information is added to this page as they complete all necessary steps for certification..